As you can see both McGill and the University of Toronto clearly dominate the picture. Interestingly their traffic seems to follow the same pattern with a clear lack of interest in the early summer months and a peak in the fall (enrollment time?). Second is Vancouver’s UBC, followed by the University of Waterloo and Queen’s. 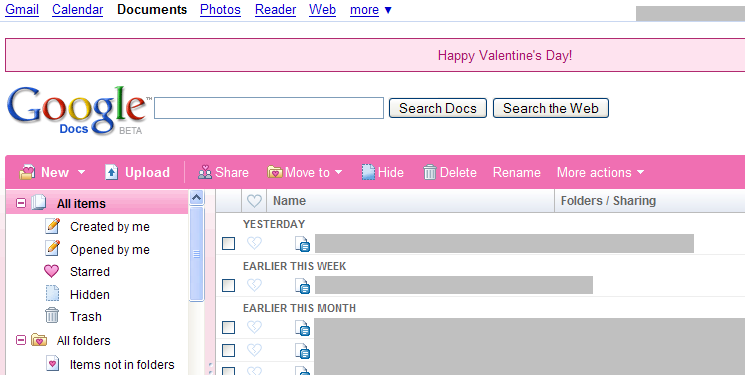 Comments Off on Google Docs goes Valentine! As Google Blogoscoped informs us, a new terrain button has been added to Google Maps. Looks very impressive, at least in the Vancouver area (not in Montreal unfortunately). Today I was stunned to notice that my GMail spam folder had risen up to 84619 spam mails! Because GMail automatically deletes spam mails within 30 days this means I had been receiving around 2820 spam mails daily, almost two spam mails per minute! This is really gross. I really hope new anti-spam technology will arrive soon. Many thanks to GMail though for having such a fantastic filter! I think I never had any false positive and right now maybe maximally 10 spam mails get through to me every day. If that’s 10 out of 2820 I can live with it. I just learned about the existence of Google Trends. This service allows you to show a graph of how often certain search terms are looked for over time. The typical periodical patterns arise with queries like “gifts“. A growing pattern can be found for example when entering “global warming” (except in the ignorant United States). On the other hand, a query for “microsoft support” suggests that their software indeed has become better over the past few years! Apple seems more worrisome with respect to that. If you compare the two with Linux however, the situation seems pretty clear. Pretty interesting stuff, I find!